Marmolada is a part of Elevation Polish's upcoming January 321 metres Collection. Marmolada has that awesome circle glitter that Elevation Polish is known for in silver and light blue, as well as silver micro glitter and lavender hexes. The base color is a light blue jelly, a little on the sheer side so layering may be needed. I applied 2 coats of Marmolada over OPI What's With the Cattitude and then applied a layer of matte topcoat to really show it off. Marmolada will be available on January 7th within Elevation Polish's shop. 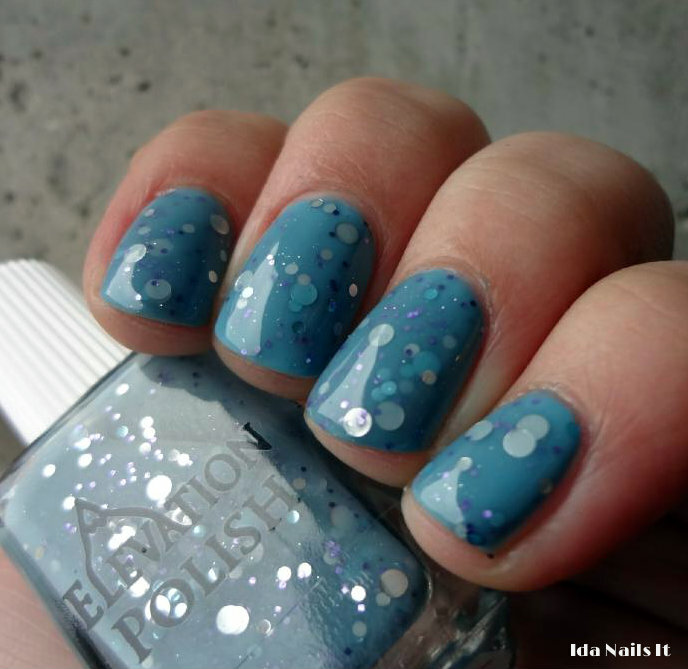 Updates on can be found on Elevation Polish's blog. those circles are really just so awesome. this looks great on you! OMG that polish is amazing. I love circle glitter so much. TY! Circle glitter are the shizz.